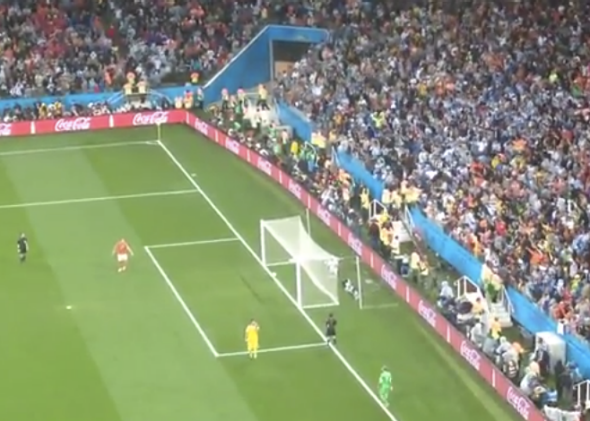 Ron Vlaar penalty: The Netherlands almost scored while Argentina's Sergio Romero was celebrating. Courtesy of YouTube user Revista Placar. Goalkeeper Sergio Romero was the hero of Argentina’s penalty shootout victory over the Netherlands, making two gorgeous saves to send the Argentines to the final. But as this newly uncovered angle of Romero’s crucial first penalty save shows, Romero was very nearly the game’s goat. The footage above, flagged by our colleagues at Slate.fr, demonstrates just how close Ron Vlaar’s penalty came to rolling back in to goal thanks to backspin while Romero celebrated his save. It was a matter of centimeters. Had the ball rolled any farther, the tournament’s goal line technology would have presumably alerted the referee with a buzzing smartwatch. At that point, the goal would have counted and Vlaar might have been the hero and Romero the villain. But it still would have been controversial because there was a question whether Vlaar illegally touched the ball with his shoulder on the bounce-back. As it turned out, Romero gets to be hailed for having provided Argentina’s new hand of God moment, but with a little worse luck he could have just as easily been pilloried for his celebration of clod.